Reward your students’ hard work with any of these fun ideas. Keep it contained in the classroom or involve the whole school! Here are seventeen awesome ideas! Feel free to add more activities in the comments. Give your students an entire week of fun during the last days of school by planning theme days for each day. Designate crazy sock day, silly hat day, team jersey day, sunglasses day, shorts day, camping day and other fun themes. Plan a fun getaway to the movies, a swim at a public pool, a game of miniature golf, bowling, roller skating or any enjoyable getaway with your students. Most kids will be happy even if the field trip is a game of kickball at a local park with some hot dogs on the grill for lunch, so long as they don’t have to stay on campus that day. Make sure you have parent permission slips with phone numbers available in case of an emergency. Also, review behavior expectations with students before leaving campus. Finally, have access to plenty of water so kids can stay hydrated no matter where they have their field trip fun day. You don’t have to leave campus to have fun the last week of school. Plan a series of events for a field day outside so students can find interesting things to do while on school grounds. Potato sack races, egg rolls, tug of war games, relay races, hula-hoop marathons, volleyball and hacky sack contests are just a few ideas. Set up a cool-down area where students can stay hydrated in the shade. Also, prepare a schedule for teachers to alternate stations so they can enjoy a break as well. Kids love watching their teachers compete with other students. Organize a couple of teams of teachers and students to participate in a volleyball, basketball or softball game. Sell tickets and donate the funds to charity or use them to purchase much-needed school items. Don’t forget to include teacher and student cheerleaders and hijinks for the half-time show. Students love to get involved, so make sure to have games they can participate in as well. Crank up the speakers to keep them dancing in their seats and you’ll give them an event they will never forget! Middle school students love to dance. Partner dancing with a purpose such as a marathon for charity and you will have no end of volunteers out on the dance floor. Scope out DJs who will volunteer their time or work at a minimal fee, decide on a charity your students would like to sponsor and set some ground rules, such as ten-minute breaks, the length of the dance and cycles of chaperones. If your campus has the funds, set up a carnival on school grounds. Establish a cost for a wristband for unlimited rides, have plenty of food booths manned by parent volunteers and provide activities such as face painting, beanbag toss, ring toss, a dunk booth, laser tag or even just a game of bucket toss. A carnival will give students a chance to walk around with their friends, compete with each other and brag about their accomplishments. Hire a moon jump, a cotton candy machine and cook a few hot dogs, popcorn or nachos and your students will lose themselves in carnival fun. Designate a few hours in the cafeteria or gym where students can autograph each other’s yearbooks while they still have all of their friends around. Before students can enter, make sure they all have their names visibly posted on the cover of their yearbook to avoid anyone walking away with a book that didn’t belong to them. You might also want to remind students not to deface anyone’s property by drawing over another student’s face in the yearbook or leaving unfavorable remarks. If you have the volunteers to chaperone for a couple of hours, a place for a large group of kids to sleep and parental permission, all you need are snacks, some loud music for dancing to wear them out, a movie that largely appeals to teens and a collection of ghost stories. The kids can bring their own pillows and sleeping bags, a toothbrush and some appropriate pajamas and they will be all set. All this fun end of the year activity will really cost you is time. It will take some time to plan and practice, but staging a talent show for your campus can be a great way to wrap up the school year and give your students a chance to express their creative energy. It takes guts to get up on stage and show the world—or even just your middle school—what you can do, so give students plenty of ideas where they can feel at ease if they choose to participate. Get the entire campus involved so everyone can help sell tickets, decorate the stage, operate the music, take care of the lighting, sell snacks, judge rehearsals for appropriateness, and record the event so you can all enjoy your school talent show all over again. Using premade elementary-style certificates found at any teacher supply store, create a set of silly certificates for your homeroom class, your favorite class or all of your students. Help them relive the happy moments you shared together as a classroom family, whether with silly nicknames or little unforgettable moments. Awards for Best Paper Passer, Favorite Helper, Brightest Smile or Greatest Laugh are some generic awards you might offer. Attach some shiny stickers, a sweet-smelling pencil or cheery bookmark and you will have a great little ceremony to help your students remember the fun they had learning in your classroom. Scan your collection of pictures from the school year and assemble them into a memorable video yearbook using a program such as Windows Movie Maker or iMovie for Macs. Throw in a few fun, funky songs with a tearjerker or two and display a personal message to your student on the final screen. Your kiddos will alternate between laughter and tears, but all in good fun. Nothing like taking a digital trip down memory lane together. Let your students be sentimental and show their appreciation by writing a thank you letter to their favorite teacher or teachers. Volunteer some pretty paper and markers or crayons so students can add their personal illustrations. Not only will you teach students a dying tradition, but your colleagues will thank you for the opportunity to hear from their students, as well. Break out the tunes, pass out the microphones and get ready to crank up the volume! You may be surprised to hear even the shyest students get up and sing their favorite songs before their classmates. Make sure all music lyrics are appropriate for a school event, students have easy access to a screen displaying lyrics and booing or heckling is discouraged. Everyone should have a chance to feel like a star, even if it is only for the length of a song. Have a book of tongue twisters lying around? Line up your competing kids in rows and display tongue twisters on your projection screen so others can see what their classmates are attempting to say. Their cheeks and ribs will ache with laughter by the time your students finish this activity. Whether it’s Scrabble, Monopoly, Clue or Life, bring in some munchies and settle down for a board game marathon session. Time flies when you are having fun, and it is always interesting to witness how students play games together. Teach them a new game they have never tried before at home and let them take over the board. If board games are not available, throw together a game of charades, Pictionary, balloon volleyball, paper ball hacky sack or Boggle on the board. Chances are they will discover a new favorite game that is not plugged into a TV screen. Get your class in the mood for the upcoming summer months with a few summer-themed movies. The latest blockbuster out on DVD, a spine-tingling spooky flick for teens that’s appropriate for classroom use, or a favorite animated film will surely keep your kids interested while you take care of last minute classroom or campus procedures. Don’t forget the popcorn! Volunteering is a beneficial activity, especially for young adults. Can your students help clean up a local park? Or perhaps they can write cards to senior citizens in a nursing home. Brainstorm with your classroom for ideas to help others. 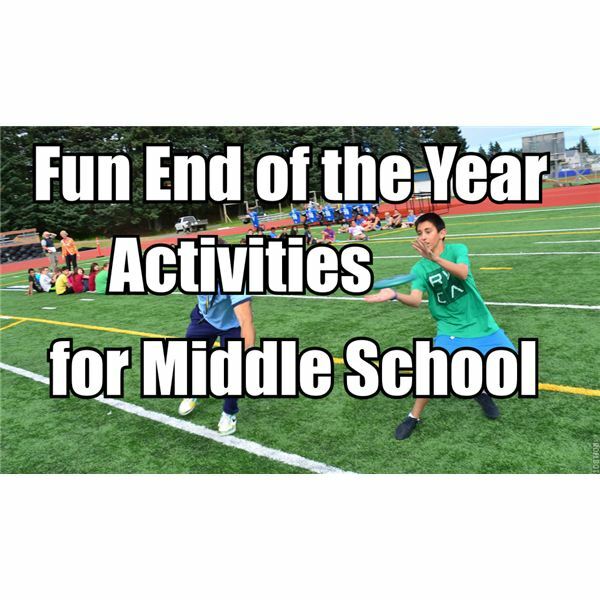 Whatever fun year end activities for middle school students you plan this year, expect the unexpected and have a back-up plan thought out just in case an unforeseen circumstance intervenes between you and your activity.